FPS PowerSewer® System has a more flexible, service friendly, and efficient system for residential and commercial applications. 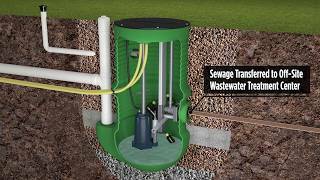 This low-pressure sewer system is available in 60-,72-, 84-, and 96-inch basin sizes and pumps wastewater to a collection or treatment area, making it a proven alternative to gravity sewer systems and septic tanks. Featuring an isolated pump support that can accommodate heavier pumps for expanded applications. Providing added installation flexibility through the compatibility with the entire line of Franklin Electric FPS 2 hp grinder pumps, including the new FPS IGPDS Dual Seal Grinder Pump Series, and any single phase, three phase, manual, or automatic version of Franklin Electric’s high head grinder pumps. Inclusion of the FPS high head grinder allows the updated FPS PowerSewer System to produce a maximum shut off head of 200 feet, with a maximum flow of 35 gpm. up to "Alarm" Float Basin Volume "Alarm"